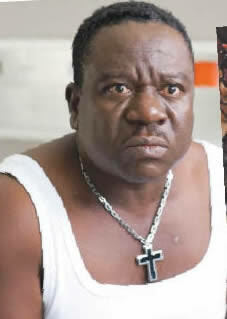 Nollywood star actor and comedian,John Okafor,popularly known as,Mr. Ibu, in this interview expresses his reservations on the efficacy of the current anti-corruption war even as he revealed that Enugu State has abundant latent Nollywood potentials yet untapped. What do you foresee for the Nollywood industry in 2016? The picture I foresee for the Actors Guild of Nigeria,AGN,in 2016 is big. But,there is a clause. The clause there is that we should stop attacking each other. If we stop attacking each other by going to court and police every minute including washing our dirty leaning in the public, we will go far. AGN is one all over the world. Our own should not be an exception. Good administration has eluded us for so long now. We do not have people that can pilot the affairs of the AGN. We are fighting every minute. How do we succeed in life in that kind of atmosphere? Now,I sent a proposal for Film Village to the Federal Government. Only God in Haven knows weather it has gotten to the designated point or not. The same thing was sent in to the government of Enugu State. We are conducting a poll to ascertain where will be most suitable for citing a Film Village. Enugu State scored 83%. It means that if ever we are going to have a film village, Enugu State is the most suitable nationwide. Second to Enugu is Lagos, with 53% then Owerri, Asaba, 38%,34% respectively. That is why if you watch most Nollywood films,t here locations are shot in Enugu. So we have more advantage than any other place. We are looking forward to having that film village in Enugu. It is very important. Let government make us responsible rather than looking beggarly,going to government houses and so on. I promised myself that I will never be part of the people going to government houses seeking alms. Our people should stop piling themselves in government houses. When ex-President Goodluck Jonathan was in office,every minute they were there asking for all maner of favour. And the ex-President loved us so much that he gave them huge money. All those who diverted monies meant for AGN or Movie Makers will die because they do not know the souls they have killed. For 2016,if all these things are taken care of, AGN will do better. I am promising one thing, am not contesting anything on the AGN but, I have a lot of surprises. Now that you said Enugu State ranks highest for citing of the Film Village, have you taken your proposal to the government? A woman working with me has sent in the proposal. The federal or state government might not spend much because we will go ahead and get sponsors. They will come and build a five-star hotel with a big gate carrying a neon sign,AGN. All the things one may need from all accredited members of AGN will be there. We will be resident inside the village. People will come in,shoot pictures,shoot musicals among others. I have all these things inside. I equally have friend who are not Nigerians willing to come and invest. What is your perception of the President Muhammad Buhari-led government anti-corruption war? It is too early to fight this. I would have preferred the government to set their house in order first. Set the administration going,make the people who voted you talk good of you as you are coming in. The corrupt people know themselves. While your good work is going on,you can then start picking them one after the other. Whoever that has offended government knows he or she has done so. Government should set its house in order first. Let the good things about this administration flow first before the arrests. Let Nigerians talk good of you first, then you can now tell them,there are people who did this and that,that need questioning. But starting with this quarrel,fighting as a new government,I do not think it will help. Many people are talking about hunger,no money,collapsed businesses among others. They would have first of all laid good foundation about their administration so that people will feel them first. The change should be seen in the peoples’ welfare and every other thing will follow. That’s my own idea. Why is it that most Nollywood films tilt towards,ritual and affluence that are perceived as lacking morals? Films are a reflection of the society. Nobody believes he is a poor person in Nigeria. We are trying to give proper interpretation of what is happening in the society. Films give back the life in the society. But,already,we have held a meeting that all things should go and give way for films dwelling on family,tragic,comedy stories. The issue is that the ritual thing can’t even go in the society. My father for instance, was poisoned to death by his best friend. I was small then. When my father died,he told my mother in a dream about three weeks after, that it was his best friend that killed him. In that dream,my father told my mother,invite the man who killed me but nobody should hurt him. My father equally instructed my mum to invite my brothers and relations inside our compound. Tell them what I said. My mother invited the man, as my father instructed and other relatives. My fathers instruction was done exactly as it came. They told the man what my father said. He denied and they said okay,you will eat the yam roasted on my father’s grave. If you did not do it,you will go home, but if you did it,you will die here. The yam was roasted on my father’s grave in the presence of the man. All the elders in my village ate the yam and said the yam was sweat and that we did not put poison in the food roasted on father’s grave. Then came the turn of the man. The elders asked him to say that if he was responsible for the death of my father,Emmanuel Okafor,let this food be the last food he will eat. But if he did not know anything about my father’s death,let his life span be increased. The man who killed my father refused to eat it. And remember,my father had warned us in the dream,that we should not touch him. When he refused,nobody touched him and he left. That is to tell you that the rituals we are shooting is real. But the new generations coming up,they are oblivious about these concoctions. That is why we shoot films to highlight these things so that people will know and shun such evil ways. What happened to the money,ex-President Jonathan allegedly gave to the AGN as loan? Laughter…I did not see one naira oohhhh! I do not know who processed andcollected it. If the money was released,I do not know. If they did not release it,I do not know. The people who were supposed to give us information, talking about the leadership of AGN, did not tell us anything even the first $200 million,nothing was heard of it. What am looking for is hectares of land for the Film Village,then I will leave acting.